The pattern set out in Fig. 104 has a large application in spouts for all kinds of articles, such as tea and coffee-pots, tin kettles, water-cans, etc. One simple application is shown in Fig. 105, the setting out of the pattern being practically the same as in the former case. The line C 4 on the spout is made the same length as C 0. The line 0 4 is taken as the base of the cone, a semicircle being described upon it and divided into four equal parts. Perpendiculars are drawn from each point on to 0 4, and then the radial lines from the apex of the spout cone to meet the body of the article. From each point where the radial lines meet the body, lines square to the centre line are drawn to the outside lines of the spout, these giving the lengths required for the pattern, which is marked out as shown. When the spout is rounded up, the end should come elliptical and lie level against a flat surface. If the body of the article is circular, this shaped end of spout will, of course, not be correct, openings being left on each side. If the body be of large diameter and the spout comparatively small, then the defect will be inappreciable; but if otherwise, then another method must be adopted which will give a spout fitting around the part of body about hole, and thus leave no opening. This further method, which is somewhat difficult, will be shown in connection with other work later on (see page 141). The spout pattern, as struck out in Fig. 105, can, after a little experience in setting out, be quickly altered to suit a round body by the addition of parts something like those shown by the shaded strips. 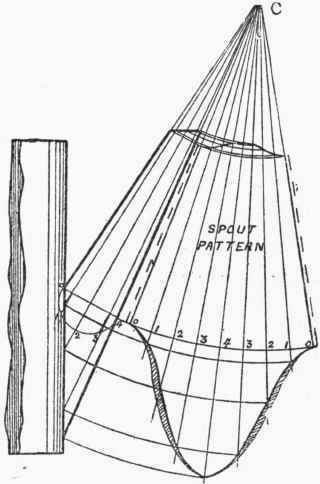 It will be noticed that the seam is arranged to come on the top side of spout; if required on the underside - the centre line of pattern would then become the outside line of same. Round Hopper on Pipe. Another interesting application of the cut cone is that of a hopper, as shown in Fig. 106. This is really the junction of a cone and a circular pipe, the axis of the cone being perpendicular to, and also meeting, the centre line of the pipe. 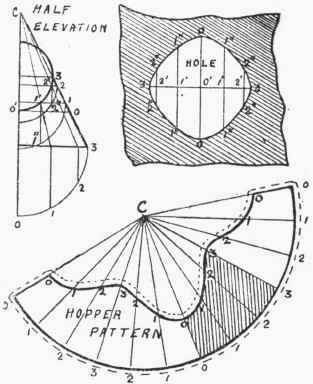 The striking out of the pattern for the hopper and the obtaining of the shape of hole in the pipe-plate are illustrated by Fig. 107. 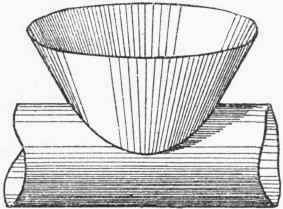 A half-elevation of the pipe and cone is drawn, and on the base of cone a quarter-circle is described. This is divided into three equal parts, and lines run up from each of the points, and then joined to the apex of the cone. Where these lines intersect with the bottom part of the pipe, lines square to the cone axis are run to the outside line. To mark out the pattern, the full cone is first set out in the usual way, and the radial lines drawn as shown. All the lengths to form the cut are taken, as before mentioned, from the outside line of the cone in elevation. Thus, lines C 0, Cl, etc., on the pattern will be the same length as the lines bearing similar distinguishing marks in the elevation. As each quarter of the pattern is exactly the same, some of the lengths, it will be seen, are used four times over. In large work a part pattern like the shaded portion is all that is necessary to set out, as this for marking out the full plate can be folded four times, or the plates cut in sections to form the hopper. Laps have been added for wiring, grooving, and stretching; but the allowances for any particular job will, of course, depend upon the size of hopper, and whether made of sheet or plate metal. Before proceeding to set out the shape of hole in the flat, the widths required for the different parts must be first determined on the elevation. Thus the width of hole at the middle of pipe will be equal to the diameter of the cone at that part; that is, twice the line 0' 0 which is drawn across the half-cone. The width at 1' will be found by drawing a line across through the point as shown, and on it describing a quarter-circle, then drawing a line down parallel to the axis of cone, this line giving half the width of hole at that point. A similar construction will give the width at point 2'. Now in marking out the hole (Fig. 107), the length 33 is made up by the three arcs with the same numbers on the pipe in elevation. Cross lines are drawn, and the widths, as previously obtained, set above and below the line 33. There should be no difficulty in following the setting-out of the hole, as the lines on it are figured in identically the same manner as those from which they are obtained in the elevation. Holes are rarely set out in the flat in the shop, the cumbersome method of chiselling them out after the plate is bent very often being followed. But with a little practice holes can quickly be struck on the plates, and this will often save a lot of trouble after shaping. When the pattern is for a stock article the extra time taken in marking out the hole properly is always well repaid.